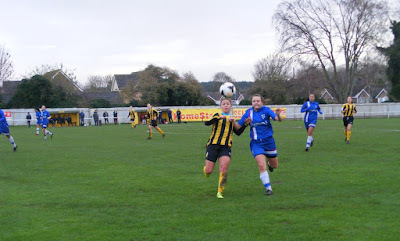 Football action today from the FAWPL South East Division One, with 3rd placed Gillingham FC Ladies travelling north to take on an in form Cambridge United WFC. Has certainly not been the start to the season Cambridge United WFC had been hoping for after their summer merger with Cambridge United FC following on from bring Cambridge WFC before. 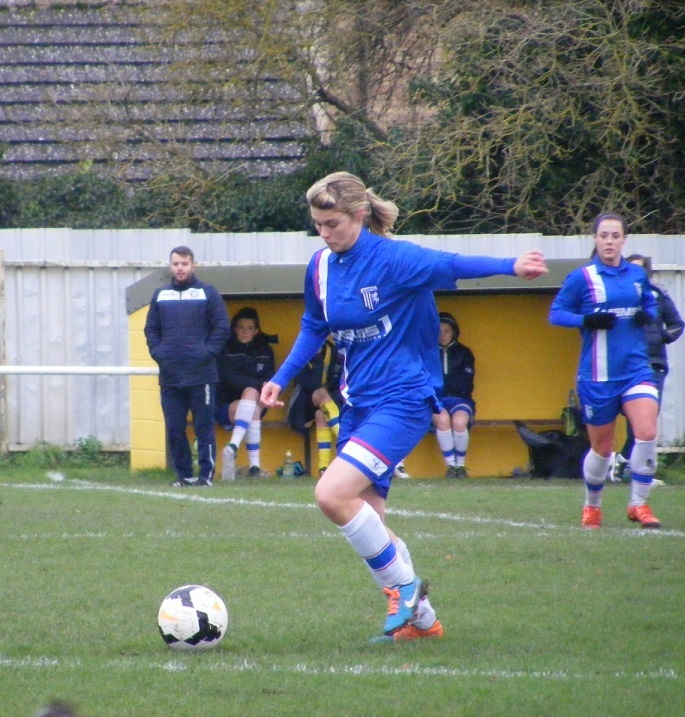 A slow start in the league and early exits from both the FAWPL League Cup and FA Women's Cup. Went 8 games at the start of the league campaign without recording a victory with 4 losses and 4 draws. 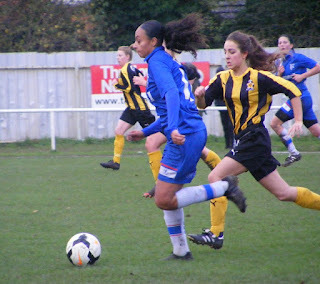 However since their last draw, 1-1 at home against league leaders Crystal Palace Ladies the side has hit a hot vein of form that has seen them win their last 3 league matches in a row and as a result start to move up the table, 10 points from 4 games played lifting them up into the top half of the table, at least another point today would see them up to 5th spot and closing on on the chasing pack behind runaway leaders Crystal Palace Ladies. 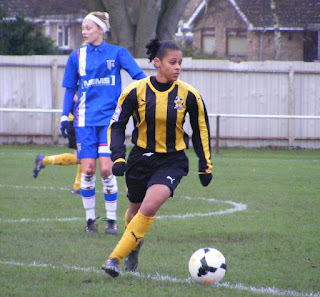 Have added a couple of new addition's to the squad recently too, both in attack, Paige Logie a player whom manager Steve Edwards knows well and asked to come and play for Cambridge has done well scoring 3 goals in her 4 appearances to date although was unavailable today. 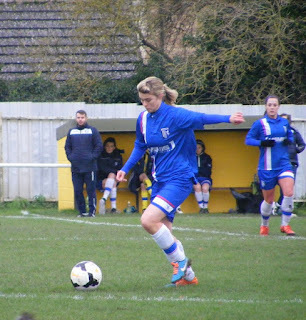 Sarah Wiltshire has also come in on a short term basis from Yeovil Town Ladies to add firepower, cunning and experience to the attack. 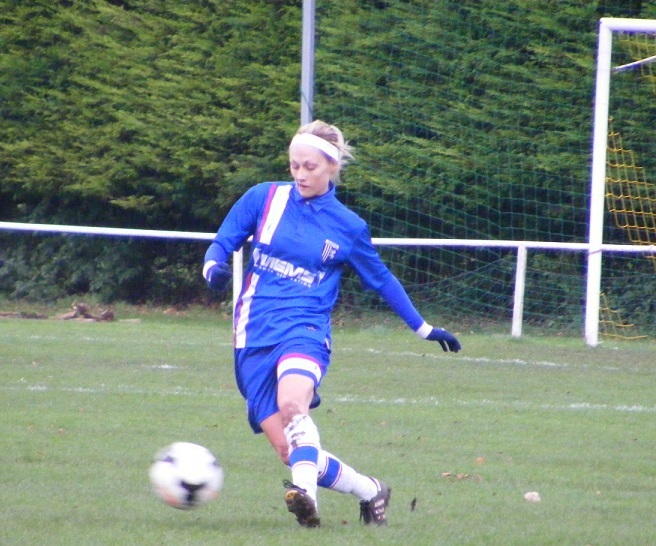 Gillingham FC Ladies are one of the sides in that chasing pack are sitting in 3rd spot on 18 points. Have played less matches than any other side in the top half just 7 to date have won 6 of those with just the one defeat against Crystal Palace Ladies at the start of the season. Were relegated from the FAWPL Southern Division last season and had the FAWPL Play-off final in May gone in Portsmouth Ladies favour would still be in the FAWPL Southern Division. Instead they were relegated and are looking to bounce back at the 1st attempt. Haven't seen much league action of late just the one game in October did have a league game away to Norwich abandoned due to heavy fog at the start of November, have however played plenty of matches in various cup competitions in that time. Now back into league action are looking for 3 points to close the gap upon the leaders and 2nd placed Luton Town Ladies. Goalkeeper Sarah Quantrill has joined the club on loan from Millwall Lionesses and starts for Gillingham today. A different venue for today's game for Cambridge United WFC usually play at Ely City FC but with the ground unable this Sunday a new venue was found so instead of heading down the A10 it was the A11 instead to Mildenhall Town FC. Have been there recently to watch the Women's County Representative match between Suffolk and Hertfordshire. A nice clubhouse beside and large sized pitch that has seen alot of football of late, still has plenty of grass cover mind a distinct slope from one goal mouth to the other. Refreshments available a hot cup of tea always welcome on a cold day like today, plus a very good tasty hot cheeseburger too. A cold but bright day, a little cloudy few spots of ran in the air as the two teams walked out onto the pitch. Cambridge United WFC starting XI - Verity Crook, Emma Jenkins, Lucy Du Plooy, Laura Bright (C), Kayleigh Anne Burt, Tahnee Perfect, Hannah Goodchild, Sarah Wiltshire, Laura Mills, Isabella Simmons & Becky Taylor. subs - Liz Pamplin, Laura Baker, Carrie Bennett & Faith Hewitt. Gillingham FC Ladies starting XI - Sarah Quantrill, Lauren Williams (C), Madison North, Charlotte Thurston, Rachel Ahern, Emma Tune, April Bowers, Jade Keogh, Shannon Redhouse, Paige Baker-Carroll & Kallie Balfour. subs - Courtney Shanley, Katie Hardaker, Ashleigh Loosemore & Lydia Wills. It's Cambridge to get the 1st half underway wearing their home kit, amber and black vertical striped shirts, black shorts and amber socks with Gillingham lined up opposite wearing blue shirts with a red and white vertical strip down the right side of the chest, along with blue shorts again with a red and white horizontal stripe on the left leg as well as white socks with a blue band. Is a competitive start with play congested to the middle 3rd on the far side of the pitch to which I'm standing, in front of both dugouts. Cambridge are attacking down the slope 1st half, have Becky Taylor playing on that side in attack look to send the pass forwards for her to chase down, Gillingham captain Lauren Williams defends well, her long ball forwards brought down by Jade Keogh her back to goal in a central position 25 yards out has striker Kallie Balfour ready to make the run into the area to her left looks to roll the ball into her feet, Cambridge right back Emma Jenkins gets across Balfour to make the blocking tackle inside the D.
With play getting attracted to the far side of the pitch there is space on the near side for players to exploit, Cambridge win the ball in the middle the ball is played out into space on the right for Laura Mills to run onto getting her feet on the ball delivers the cross early sweeping it in towards the far post, Taylor has made up the ground to get to the ball, left of goal inside the six yard box turns her effort wide. Both sides are working hard to close the ball down, looks like little chance of getting beyond the others defence either as both are quick to drop back towards their own box when the opposition get hold of the ball. The space is their on the opposite flank for Gillingham in their next attack with Balfour seeing Paige Baker-Carroll available on the right, driving forwards on the ball can't find a way past Jenkins as the full back dives in to take the ball from her feet before she can get the cross away. Mills on the right for Cambridge surges down the wing, Madison North halts her progress sliding in to win the ball put it out for a throw. 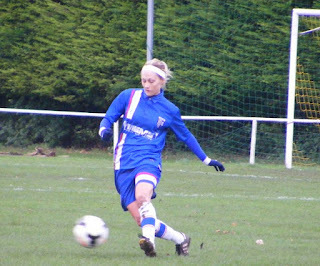 Halfway inside the Gillingham half Sarah Wiltshire comes towards the throw wants it put into her feet, gets it, turns and runs into a central position 25 yards out hits the shot on the run the spin on the ball takes it wide of the goal. Wiltshire sets up the next chance as the ball is put into her feet out on the left, drives into the centre with Mills coming towards her wanting the ball, 30 yards out she gets it shoots 1st time, several people thought it was in, very close but just over the bar. Balfour is a powerful player hard to stop when she gets in full stride on the ball, April Bowers plays a beautiful pass to dissect the Cambridge defence, she is clipped as she bursts into the box, stumbles slightly but stays on her feet the ball has just gotten away from her enough to allow Cambridge goalkeeper Verity Crook to race out and gather the ball at her feet. GOAL! Has been a fast paced start to the match not even quarter of an hour played and the deadlock is broken. Cambridge are the side celebrating as they take the lead a rapid counter attack the ball put into Mills in a central position lofts the ball forwards with Wiltshire catching the Gillingham defence flat footed breaking clear, Sarah Quantrill races out of her area to try and close her down, Wiltshire with the outside of her boot lobs the ball over her and it rolls into the back of the empty net 1-0. Emma Tune is getting plenty of time on the ball in the centre of midfield for Gillingham, Cambridge are allowing her to travel a good distance with the ball without challenge reaching the edge of the area before running into traffic Tune slides a great pass through to try and set up a chance for Balfour, Crook is off her goal line quickly slides in to smother the ball at the strikers feet inside the six yard box. Joining the Cambridge midfield in winning the ball back Taylor takes it into the middle her pass releasing Mills into space on the right again, North makes up the ground the two go shoulder to shoulder into the area North pushing Mills wide of the goal, the Cambridge attacker still manages to get a shot away, Quantrill has the post covered dives to her right makes the save. 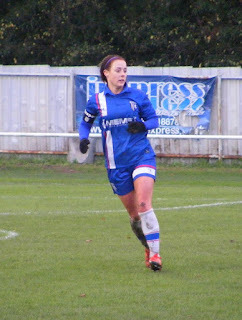 Both Gillingham centre backs Charlotte Thurston and Rachel Ahern are both comfortable on the ball when they bring it out from the back and are prepared to travel with it when the opportunity arises, in this attack it's Thurston who brings the ball forwards passing it into Bowers in front of her the midfielders picks up her pace looks to send the ball into the box with Balfour breaking forwards, Crook comes once again the two collide as she makes the save, Balfour stays down the ball isn't cleared finds it's way to Baker-Carroll on the left takes on the shot aiming for the near post, Crook has her angles right is well placed to claim the ball. Balfour needs some treatment, Gillingham continue with 10 on the field. There are a few strong challenges coming in the Cambridge bench in particular aren't happy, the referee is giving the free kicks but happy to keep the cards in his pocket, tell everyone to calm down. Baker-Caroll and Jenkins are having a good contest on one side of the pitch whilst on the other Shannon Redhouse is getting little joy against Lucy Du Plooy. The home side win a free kick 35 yards out after Thurston brings down Mills, left of the box it's Cambridge captain over the ball, goes for the shot, good effort, dips late on not enough to worry Quantrill who watches it all the way just over. Gillingham's North takes the ball up the pitch into the Cambridge half the left back covering alot of ground unchallenged before playing the pass into Baker-Carroll, getting beyond Jenkins this time, looks to surge into the box, Bright has to get her tackle right, does well as she slides in to take the ball away from Baker-Carroll. Good combinations all over the pitch from both sides, Taylor on the left for Cambridge once again coming inside and finding Mills on the right with the pass, this time it's Ahern who goes shoulder to shoulder with her into the area pushing her wide making the angle for a shot or cross difficult, when Mills does get across it's Ahern's centre back partner Thurston that is across to win the header clear the danger. Bowers on the ball inside the Cambridge half plays the pass out to Baker-Carroll on the left, she plays the early cross on the diagonal in towards the far post a high looping ball which Balfour is under, waits for the ball to drop to her feet snatches the shot wide of goal, took a deflection off a Cambridge boot, corner given. Form the left the corner is headed over at the near post by a Cambridge head for a 2nd corner. This one is played deeper over the crowd drawn to the near post, Balfour is beyond everyone on the penalty spot the ball drops to her hits it on the volley smashes it against the crossbar! Drops back into play a Gillingham boot makes firm contact outside the box smashes the shot wide across the face of goal. An action packed 1st half as good as any I've seen in the FAWPL South East Division One a great game to watch so far from two competitive and committed sides, attacking down the slope 1st half Cambridge have edged the contest so far have the advantage, Gillingham haven't found too many gaps down the home sides flanks in the 1st 45, would having the slope in their favour give them more opportunities 2nd half as they get the 2nd 45 minutes underway. Redhouse getting onto the ball on the right side of the pitch for Gillingham looks to turn inside drive towards the box, is stopped in her tracks by Kayleigh Anne Burt. Play is broken up by both defences as the 2nd half starts as frantically as the 1st. Perfect with a good interception gets onto the ball inside the visitors half plays the pass into Wiltshire who holds the ball up well before sending it out to the left of Taylor making the run to the byline, gets the cross away, Thurston tracking back has the near post covered rises to meet the ball with her head get plenty behind the clearance. Midfielder's making surging runs from the middle towards the box are the feature of the day, Hannah Goodchild is the next to win the ball and bring it up the pitch for Cambridge her pass looking to put Wiltshire through in the centre, Thurston stays on her lunges forwards to take the ball out of her path. Thurston bringing the ball out from the back travels over halfway puts the ball into Keogh who shoots early, Burt makes the block. Cambridge launch a counter attack with Mills after the ball on the right is fouled the free kick awarded right of the area. Wiltshire is over the ball whips it in towards the crowd at the near post, it's a Gillingham head that meets it to head the ball clear. Might be a great match to watch, but I'm trying to write it down, barely getting one attack on paper before the action is in the opposing half, Balfour has come towards the ball with Bowers making the run looking to go beyond her 25 yards out in front of the Cambridge box, a good turn and slide sees Balfour put the ball in front of Bowers, only Bright getting across to make the blocking tackle prevents her being in on goal. Tune with another good run from the middle has support from Baker-Carroll on her left, looks to play the ball into her path as the Cambridge defence back pedal to the edge of their area, Bright is closest gets something on the ball, can't control the clearance plays it straight against Tune, running forwards she attempts to control the ball flick it up to hit on the volley, a difficult attempt gets the shot away the spin on the ball turns it away from the goal wide. Gillingham are starting to find a little more possession playing it out wide to Redhouse she drives towards the byline wins her team a corner kick. Making herself available for a short one has the ball at her feet 25 yards out sweeps the cross in to the near post area, Goodchild back to defend rises the highest to clear the ball, it drops favourably for Tune outside the box puts everything into the shot on target Du Plooy was defending the far post for Cambridge clears the ball. Keogh is the next Gillingham player to have a strike at goal from distance 20 yards out wraps her foot over the ball, sends her effort wide. Is her last action of the game as the visitors make their 1st change, Keogh coming off, Katie Hardaker the player to come on. Ahern get's across in front of Wiltshire to head the ball away after Taylor looks to put one over the top from the left into the Gillingham box for her to chase. Cambridge make their 1st change too, bringing on Laura Baker to join the midfield in place of Goodchild. On the of the attack for Cambridge her back to goal Taylor shields the ball well with Du Plooy looking to join up with the play rolling the ball back to her the left back hits a long ball over the Gillingham defence with Wiltshire ready to break beyond into the area, Quantrill converges on her left of the goal 8 yards out to put her off does enough as they meet Wiltshire's touch taking the ball wide of the post. Gillingham captain Williams is the next substitution hands the armband to Thurston as she makes way for Ashleigh Loosemore. Cambridge with another change to, Du Plooy coming off with Carrie Bennett taking on the role at left back. Baker drills a shot wide from 35 yards out after Gillingham clear a Taylor cross put in from the left. Bowers with the lay off to the right into Redhouse as she bombs forwards the angle is tight she takes on the shot sends the effort over the crossbar. GOAL! Gillingham have been knocking on the door shots blocked this time they find the space behind the Cambridge defence and score the equalising goal. North is the player to bring the ball out from the back over half way plays the pass into Bowers ahead of her, Bowers sees Balfour moving into the space on the right, Crook commits herself has to come towards the Gillingham striker close her down, Balfour hits the shot the ball going past the diving keeper, looks to be heading in, Bright racing back throws herself at the ball on the line can't get anything on it as Baker-Carroll sliding it at the far post gets the final touch to ensure the ball goes over the white line 1-1. Cambridge make a change before the restart bringing on Faith Hewitt, to play on the left with Taylor the player off. Perfect fizzes a pass into Wiltshire her back to goal outside the area, controls and hits the shot on the turn smashes it 3 yards wide of goal. The end to end action continues, Redhouse on the right looks to put the ball into the feet of Hardaker making a great midfield run, Burt gets to the ball 1st on the edge of the area. Redhouse with another chance to cross the ball in from the right plays it across the front of the box, comes to Baker-Carroll, she hesitates the chance to shoot gone rolls it back to Bowers in the middle turns rolls her marker before hitting the shot sends it wide. Crook has to be alert late on as Gillingham send a long ball forwards from inside their own half, with a a group in front of her inside the box looking to attack the ball, no one gets a touch bounces in front of her has kept her eye on the ball drops forwards to claim the ball. Both sides with half chances towards the end neither keeper is troubled as the referee blows the final whistle the points shared the game ending 1-1. Gillingham come back to claim a point to stay in 3rd place grew stronger as the 2nd half progressed found the equaliser were pushing hard for a winner towards the end finding a little space behind the hard working Cambridge defence. A good point earned for Cambridge worked hard all over the pitch to close the ball down. A great game to watch, the Mildenhall crowd not one to have seen alot of women's football had plenty of positive comments to say about this one. 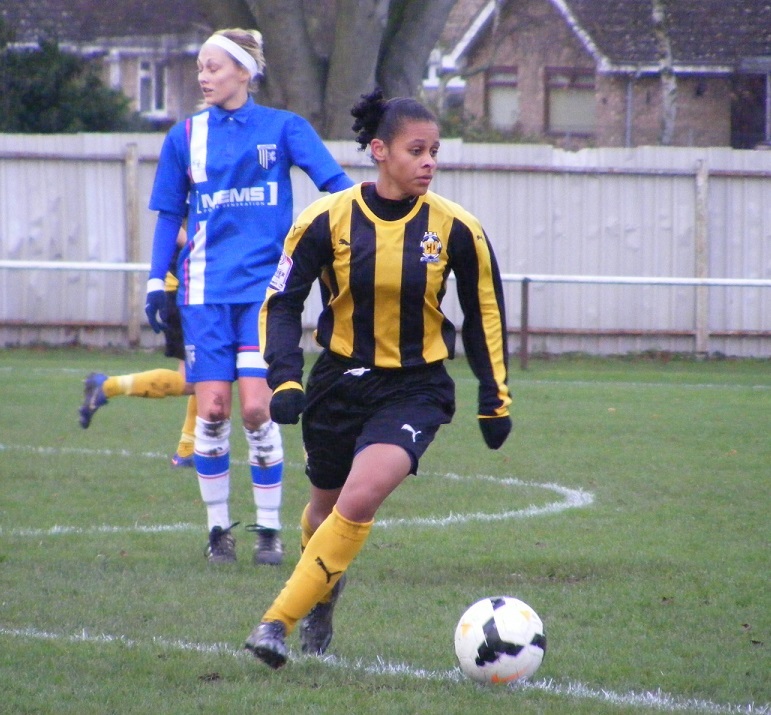 *Updated fixtures - Cambridge United WFC are no away to Ipswich Town Ladies this coming Sunday, not playing Gillingham FC Ladies back to back as previously written on the blog. My thanks to both clubs for their help today.